On April 15, a Vietnamese naval vessel left for a voyage to Indonesia and Singapore. Though the trip is just the latest in a series of scheduled maritime missions by the vessel in the region, which has only recently been integrated into the country’s capabilities, it has put the spotlight on the evolving shape of the Southeast Asian state’s maritime diplomacy with neighboring states in the region. As I have noted previously in these pages, over the years, Vietnam has built one of the more capable navies among Southeast Asian states as it seeks to both secure its own interests while also engaging more with other states in the maritime domain. A relatively recent addition to the Vietnam People’s Navy (VPN) has been the Le Quy Don (classified as Sailing Ship 286). 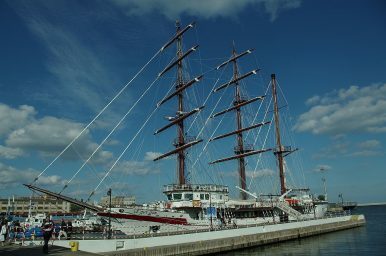 Named after an 18th century Vietnamese philosopher and built in Poland, it was first commissioned into the VPN in March 2016 and billed by Vietnam as one of the world’s most modern sailing ships. As the vessel has been incorporated in the VPN, the Le Quy Don has gradually been participating in a set of naval training activities and external missions at sea, and that has continued over the past year or so. Indeed, around this time last year, it left for a voyage to Thailand and Cambodia, which had followed previous exchanges with the navies of Brunei, China, and the Philippines. Those activities involved a range of interactions, including visits, exchanges, and basic exercises as well with these states. On April 15, the Le Quy Don departed for its next maritime mission, which will cover Indonesia and Singapore this time around. The pre-scheduled voyage, which kicked off with the departure from Nha Trang port in Khan Hoa province, is scheduled to last from April 15 to May 18 and cover a distance of nearly 2,500 nautical miles. Per Nguyen Duc Nam, the head of the mission and also deputy director of the Vietnam Naval Academy, the purpose of this particular trip will be to enhance abilities of senior naval cadets and also strengthen their ability to master weapons and equipment and interact with their regional counterparts. The stops in Indonesia and Singapore will comprise a series of interactions. Per the Vietnamese military, these will include, among other things, training activities, visits, and exchanges with naval forces there, designed to boost mutual understanding and advance collaboration between the sides. What's in the First Vietnam Navy Vessel Visit to Myanmar?Joint Patrols Highlight Vietnam-Cambodia Maritime TiesIndia-Vietnam Coast Guard Ties in the Spotlight with First VisitWhat’s in a Canada Warship’s Vietnam Voyage?A New Vietnam-Thailand Navy Pact?